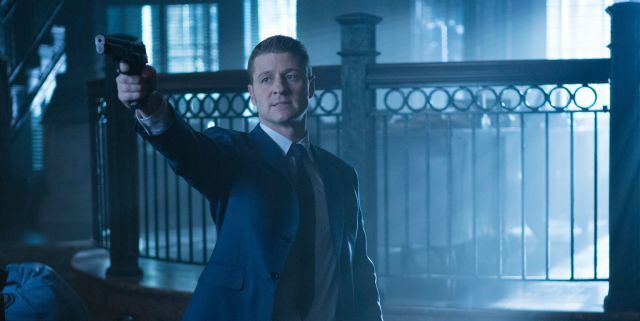 Jim marches back into GCPD HQ and demands to join the hunt for Gruber and Helzinger. The captain warns him to leave before the commissioner arrives. Too late. In a contentious meeting, Loeb gives Jim and Bullock 24 hours to bring in the escapees. If he does, he gets his badge back. If he doesn’t, both he and Bullock will rot working Arkham security for the rest of their careers. 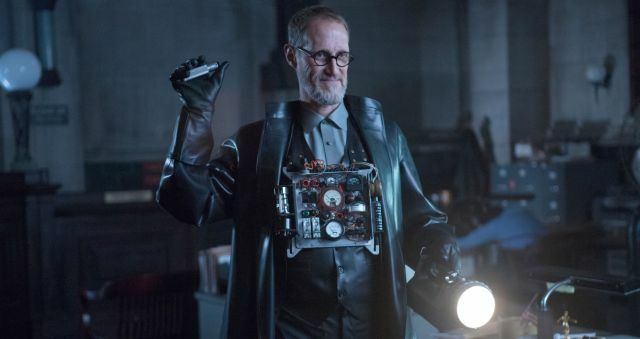 Nygma checks Gruber’s fingerprints and discovers he stole the identity of an inmate. He was sentenced to life for a series of bank robberies he made with a gang. He was the only one who went down for the crimes. Uniforms discover the stolen Arkham van, parked outside a dumpy little shop, Irwin’s Electronics. Irwin had been storing Gruber’s “toys” while he was away. Upon entering the shop, Jim and Bullock find a dead flunkie. In the back, Irwin has been lobotomized to write “I will not betray my friends” on the wall, like Bart Simpson. Back at the precinct, Dr. Thompson (or “Lee,” as she insists on being called – at least by Jim) pays Jim a visit. They make googly-eyes at each other before she reveals the purpose of her visit. One of her wards at Arkham claims to be a pagan sorceress. Other inmates make dolls for her to curse in exchange for soda and candy. Lee got the doll Gruber made to be cursed: Mr. M, which bears a striking resemblance to Maroni. Penguin is having a meal with Maroni and his crew when he gets a call from Falcone. Someone has kidnapped Liza and he needs Penguin immediately. We already know that Fish staged her kidnapping. That’s something we will get to in a minute. Penguin leaves lunch on the excuse that his mother is very ill. When he goes to the door, an electric shock knocks him across the room. An electricity bomb rolls into the restaurant after him. Maroni and his men are okay except for some minor injuries. Jim is there to take statements and suggests Maroni come into the station, under protective custody. Maroni resists but eventually agrees. Penguin wakes up momentarily, babbles something about being needed by Falcone, and passes out again. When he comes to for real, he returns to his original story of an ailing mother. Maroni confronts him about what he said earlier, and Penguin swears on his mother’s ailing health that he has no business with Falcone. Whether or not Maroni believes him is is irrelevant; he lets him leave. Gruber is in the walls of the police precinct, setting up. He returns outside and starts pumping the juice. The precinct, with its steel frame, becomes a huge ball of electromagnetic energy that knocks everyone out. 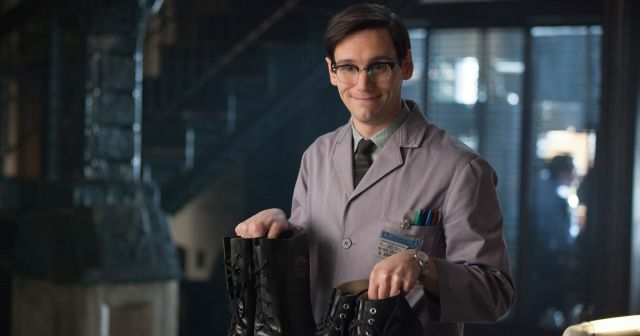 Everyone except for Jim, who put on rubber boots earlier at Nygma’s recommendation. Gruber is a little disappointed when he actually enters the station. He wanted everyone to cook; instead they were just knocked out. One of Gruber’s goons takes Maroni out to the truck. Jim pulls his gun on Gruber, but Gruber wears a crazy electromagnetic suit that drives the gun to the floor. Jim and Helzinger turn to hand-to-hand combat. Gruber cranks his electric suit up, and Jim throws water on him. He shorts out, and just like that, Gruber is in custody. There is a huge press conference in the station to announce the capture of the Electrocutioner, and Jim’s return to the force. Amid the smiling photo op, Jim whispers a threat to Commissioner Loeb: the next person who takes his badge will eat it. A little weak, but it gets the message across. As Jim tells Bullock later, he is done playing nice. Meanwhile, on the gang front… Fish stages the kidnapping of Liza, then calls Falcone (with a voice scrambler) as the kidnapper. Fish later calls as herself, claiming to have been caught up in this kidnapping and acting as an intermediary. Falcone doesn’t buy it and Fish comes clean. She lays out her terms: leave Gotham, never return, and Liza can go with you. Falcone agrees. Just like that. Zsasz thinks Falcone is just leading Fish into a false sense of security, but no, Falcone is ready to quit. He wants to go live in the country with Liza. Why not do it? Penguin finally makes it to Falcone’s house and tells him that Fish kidnapped Liza. Falcone knows this, so he tries something else to earn Falcone’s respect. He tells him that Liza belongs to Fish. She planted her with him to play on his love for his mother. It was a set up from the start. Falcone slaps Penguin, wants him to prove it. He doesn’t believe him. No time for further punishment, though: he is due at Fish’s place. On the romantic front, Barbara is having a really bad time. She visits her parents, who are incredibly wealthy, but are stereotypical “old money” – they are cold and distant and not particularly welcoming when they ask if she will be staying the night. Barbara wants to stay a few days, and mommy dearest suggests that she can stay until the weekend. Barbara assures her mother that everything is fine with her “young man.” Jim has been staying in the men’s locker room of the police station (so I guess Selina now has run of the Gordon pad…?) and Lee visits him. She is flustered and babbles all that budding-romance-nonsense before admitting the reason she was there was to get the Mr. M doll back for her patient. Jim finally grows a pair and grabs Lee for a kiss. She kisses back desperately, and the two can barely separate when an officer sticks his head in to let Jim know that there was a shootout at Fish’s place. I have to assume that the Electrocutioner will be back. He is too good a villain not to be back. His capture was a touch anti-climactic, but it also had a very Ben Edlund-y feel, and I love me some Ben Edlund. 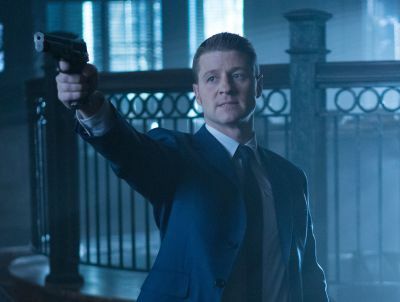 I feel like “Gotham” has finally hit its stride. First, the dueling mob stories are finally going somewhere; it’s not just pieces of mob stories to add color to the main story. They have momentum. It seems that we are giving up on the bad guy o’ the week, which is a relief. I could get that from reruns of “Law & Order” if I wanted that. We finally have a mythology evolving, an overarching story. And the attention is turning away from the kids, which is a relief. I know they will be back, but they don’t need to be the focus of the story. This is not “Batman Babies.” Of course, we aren’t that lucky with Barbara Kean – we just can’t seem to shake her. It is a little disconcerting to hate a fictional character so much, but she is just so horrible. Learning a bit of her background does not give her any sympathy in my book, so just stop trying.